The new Panasonic ES8243A men’s wet and dry shaver is an electronically rechargeable device with four blades. The blades are Nanotech and on the first round, they make a remarkable shave. There is a quadruple foil with four blades for cutting whose cutting surfaces have been expanded by a percentage of 32%. This ensures a much better impact with each pass. The Panasonic’s linear motor is the powering device for these blades and it operates at a very fast speed making even the thickest beards a walk over for this shaver. Cutting performance was improved by the use of nanotechnology which polishes the sharp 30 degree blades. Besides the Panasonic ES8253A rechargeable electric shaver providing an efficient shave, the cutting blades which have been expanded ensure that pressure is evenly distributed hence its performance does not cause irritation as experienced with other models. There are two inner blades and two outer blades with the finishing fourth blade providing an extra opportunity for cutting which is not available on triple blade shavers. The blades and foils have been “arced” so that they can gently nestle providing the closest shave into the skin. To ensure a uniform shave on face surfaces, the foil has been designed to glide evenly. The patented Panasonic linear motor that powers the Panasonic ES8243A rechargeable shaver operates at an amazing speed of 13,000 revolutions per minute enabling it to cut through thick beards. This speed is superior compared to the standard shavers whose speed is 8,000 – 10,000 revolutions per minute. This shaver has been designed to operate on both wet conditions and dry conditions. This means that it can be used in the shower or even for dry shaving when there is not enough time. 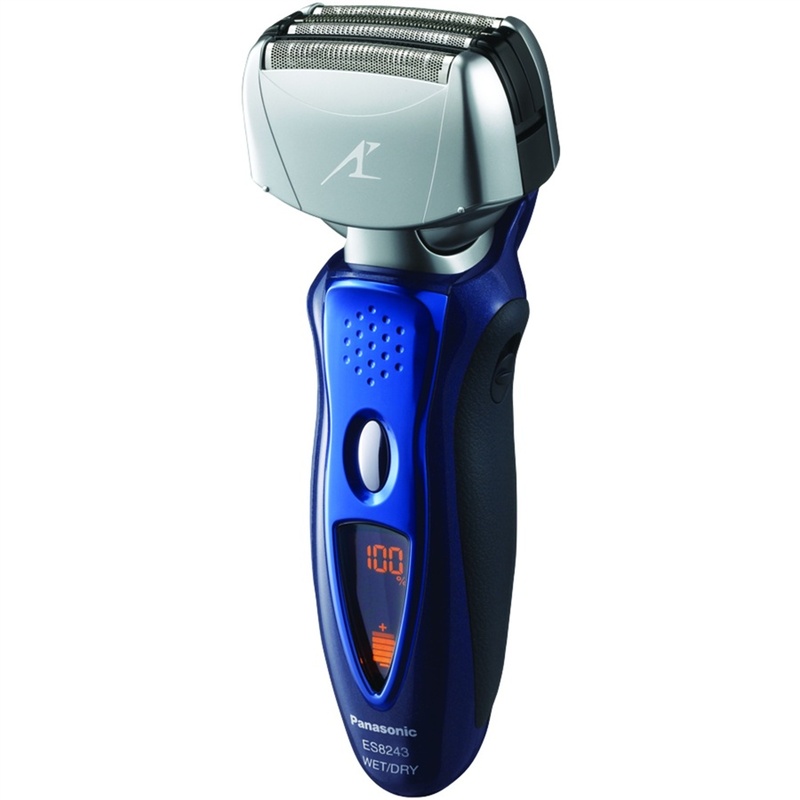 This shaver has a liquid crystal display which is used to indicate the level of the battery charge. The battery charge level has been divided into ten steps and there is also a cleaning reminder. For travelling purposes, this Panasonic ES8243A shaver comes alongside a travelling case and an AC adapter which is used for charging. This razor is even fast when cleaning it. A turbo mode needs to be activated when holding the razor under running water and this will see the cleanup happen at a hyper speed. When on turbo mode, the acceleration of the razor increases up to 17,000 revolutions per minute as it vibrates hence removing all possible whiskers that may have remained. For proper maintenance of the razor’s cutting edge, it is recommended that the inner blade and the outer foil be replaced at least once in a year. The estimated time for charging this shaver fully is around 60 minutes and when fully charged, it can shave continuously for 42 minutes. This product can be purchased at any local retail shop and online as well. Its list price is $199.99 but on amazon it costs only $113.63 which is inclusive of shipping cost. It is therefore cheaper to purchase it online and save $86.36 which is about 44%. Many people who have used this shaver are satisfied with its performance as evidenced by their reviews online.